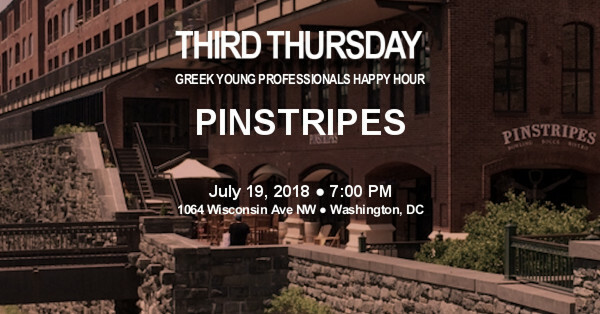 Join us on Thursday, July 19, 2018 at 7:00 PM as the Third Thursday Greek Young Professionals Happy Hour series visits the Georgetown location of Pinstripes, an Italian inspired bistro with bowling, and bocce! The Pinstripes drink menu features craft beers from local brewers, fine American and Italian wines, and $8 signature craft cocktails all day on Thursdays. If you have a suggestion on where the next Third Thursday should be, email us at ThirdThursday@DCGreeks.com, join our Facebook group. We would love to hear from you! Since 2001, Third Thursday has provided Greek-Americans, Greeks, Cypriots, and Philhellenes from the Washington, DC area and beyond the chance to meet every month in a relaxed atmosphere, particularly welcoming those who have moved from different parts of the country for work or school into the greater DC area Greek community. With visits to a variety of bars, restaurants, and lounges in the most vibrant neighborhoods of DC, Maryland, and Virginia, Third Thursday is a great way to catch up with old friends and make new ones in the Greek community. We strive to maintain the simple principles of its founders while expanding the event to an ever-changing audience of Greeks in the area. We look forward to seeing you -- or meeting you for the first time -- at the next Third Thursday.